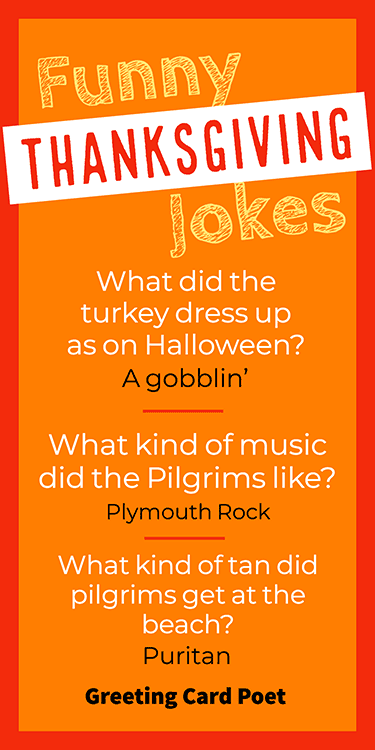 Sink your teeth into these Thanksgiving jokes this holiday season! Thanksgiving is an emotional time when people travel miles away from home just to be with loved ones they see only once a year. Luckily, these jokes are good to use, no matter what time of year it is! Instead of eating yourself into a food coma, we have harvested a plateful of jokes that you can present to everyone to feast upon. Trust us, there’s more than enough to go around to get the whole family stuffed! Let’s face it, turkeys are easy targets for hunters and this is also true for jokes. 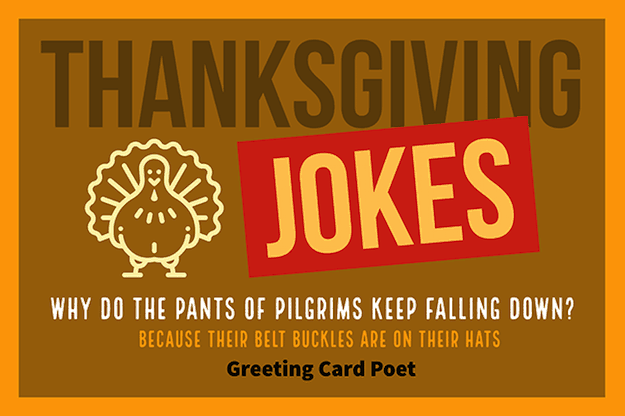 If you’re looking for some funny, clever jokes to share this holiday, overindulge and have big fun by adding some giggles at dinner during your next Thanksgiving day celebration with this heaping helping of jokes below. Enjoy and Happy Thanksgiving! How did Albert Einstein celebrate Thanksgiving? What did the turkey dress up as on Halloween? What did the baby corn say to mama corn? What do you get if you cross a pointy black hat and some leftover turkey? What did the hipster say the day after Thanksgiving? I liked the leftovers before they were cool. What’s the best song to sing when preparing your Thanksgiving turkey? What are unhappy cranberries called? What do you call a running turkey? What do you call the age of a pilgrim? Why didn’t the Pilgrims tell secrets in the corn field? Because the corn had ears. Why did the Pilgrim eat a candle? He wanted a light snack. Why do the pants of pilgrims keep falling down? Because their belt buckles are on their hats. What do you call a rude Turkey? Why didn’t the Pilgrim want to make the bread? When did the Pilgrims first say, “God bless America”? The first time they heard America sneeze. What does Miley Cyrus eat for Thanksgiving? What did the mama turkey say to her naughty son? If your papa could see you now, he’d turn over in his gravy. It simply wants to run away. What do you call an evil turkey? What does a English turkey say to another English turkey on Thanksgiving morning? To be or not to be roasted, that is the question. Because they never learned good table manners. What kind of tan did pilgrims get at the beach? What was the turkey looking for at ToysR’Us? What does a Pilgrim call his friends? Why did the Pilgrim die in the car crash? Because he didn’t buckle up. Why was the cook late to Thanksgiving dinner? He lost track of thyme. Why did the handbag hitch a ride with the Pilgrims when they came to America? Where does turkey go to dance? The turkey because he’s already stuffed. You’re on Thanksgiving Jokes page.